Published in the South Kent Gazette, 26 November, 1980. The total amount expended on these works from the beginning until 1906, when this book was written, was about £60,000. This expenditure was one of the beet investments Dover ever made. It secured the town an ample water supply, perfectly pure, which has been constant, every hour of the day and night, since 1875. These works were also considered to provide a safeguard in case of fires, the pressure on the mains, owing to the elevation of the reservoirs, being from 50 to 90lbs. per square inch. Two new Worthington-Simpson triple-expansion steam engines should have been installed and brought into use between 1937 and 1939, but war intervened and the second did not operate until the 1950s. Over 25 years’ later, when they were due to be replaced by more economical electrically-operated pumps, moves were taken to preserve them and, eventually Folkestone District Water Company sold one to the Fomcett Industrial Museum of Stationary Engines at Norwich, and agreed to rent the other engine, and the building housing it, to the Medway Maritime Museum, by whom it is to be preserved. The two engines, with consecutive numbers, were the last of their kind to be made by Worthington-Simpson, one of the foremost manufacturers of steam pumping engines in the world. (From 1850 to 1948 the company built over 1,070 large steam pumping engines, which, were installed in pumping stations from Hong Kong to Hull and from Cawnpore to Hastings). The engines were also the last of their type in regular use in this country, and it was considered Important to preserve one or two examples for posterity. For many years the boilers of the engines at Dover were fired by Tilmanstone cobbles. Cost of changing over from steam pumps to electric pumps, in 1976, was given as £100,000, and was expected to produce an annual saving of between £30,000 and £40,000. The new plant does the same job as its predecessors pumping 1,800,000 gallons of water a day. Its installation made redundant not only the steam engines but a local landmark—the waterworks chimney, which was demolished. Standby power for the electrical plant was provided by a diesel-powered generating set supplied by Petbows of Sandwich. One -man associated with the Dover waterworks for many years was Mr. Percy Knivett. He worked there for 47 years, 25 of them as superintendent. The works were for many years under the immediate supervision of Dover’s Borough Engineer, who lived at Castle Knoll, adjoining the plant. In 1970, due to a threat of nationalisation, the old borough council sold the water undertaking at Dover to Folkestone and District Water Company for £200,000. This money was subsequently used to build Dover’s long-awaited' indoor swimming pool complex to replace the one destroyed during the Second World War, adjacent to the old Seaplane Sheds. The Dover electricity supply was also owned by the town’s municipal authority and for over 40 years power which now comes from the national grid network was generated at the Park Street electricity generating plant adjacent to Dover Police Station. Dover was associated with many of the early electrical developments. Far-seeing people in Dover in those pioneer days took great interest in the numerous uses to which this new power source could be put and tried to induce interest among their fellow townsmen as well. The Rev John Lyon, who was minister of St Mary’s for 40 years from 1772, as well as a Dover historian, used to astonish and sometimes terrify his friends by his experiments in the early part of the 19th century. Before the advent of a reliable electricity supply which led to the adoption of a tramway system of transport in Dover horse-drawn buses were a familiar mode of public transport in Dover. 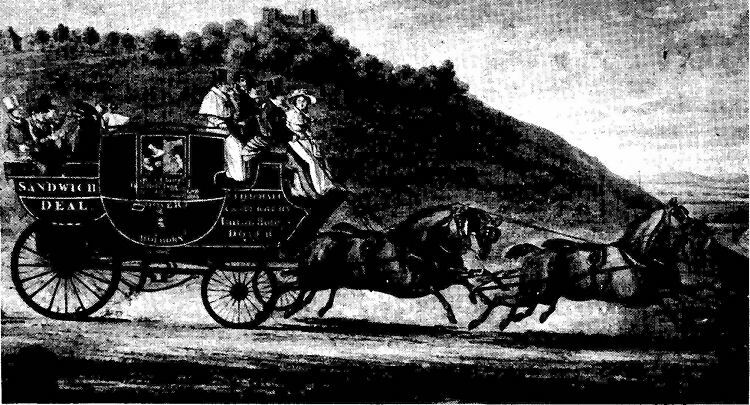 Before these were introduced there were the stage coaches, like the one pictured above, or wagonnettes. One of the earlier operators of Dover horse buses was the Sneller family whose business developed into the commercial transport firm of P. W. Sneller Ltd. which operated from premises at Cherry Tree Avenue until it closed down this year. 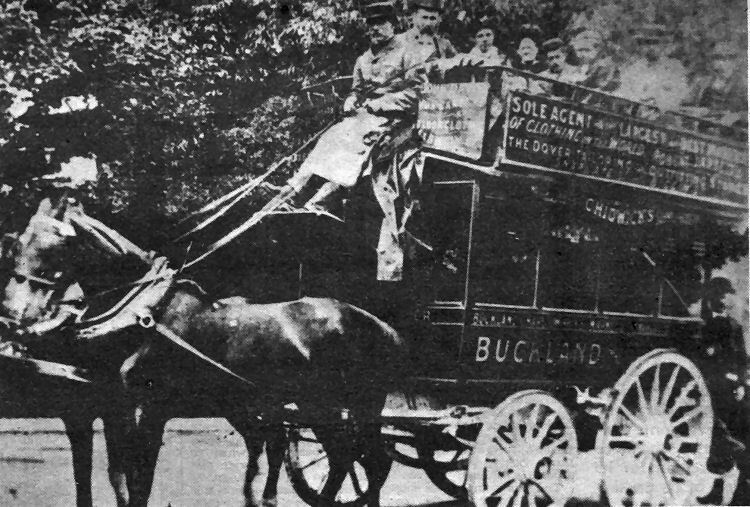 The family entered the transport business, with their horse-drawn bus, way back in 1878. For years this bus, pictured above, plied between Buckland and the town station. Like the early tramcars it had an open top deck and also like the trams it carried advertisements for local traders, including Chidwicks, the tobacconists, Robert Jarrett’s outfitting shops in Biggin Street and Snargate Street, and John Davis, a Biggin Street furnisher. The Royal Mail coach bearing the official number GR 6779 was operated by a firm with strong local connections, Richard Chitty, Robert Fagg and Company. It appears to have operated a service not only from the Union Hotel, Dover, to Holborn via Canterbury, but to Sandwich and Deal as well.